series Happily Ever After, Inc. Enter Daniella White-handpicked by the matchmaker as the perfect wife. Marriage to Leo means security, and she's willing to give up passion for friendship. But the moment they meet, sparks fly. 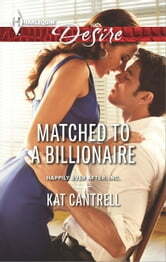 And now temptation-and Leo's own heart-have the billionaire ready to change all the rules. Interesting plot and a cute story but I’ve read a few very similar to this one. It’s very hard to write an original story when there are several books out there about marriages of convenience. Still, a well written book, fast paced and easy to read. It goes without saying that I couldn’t bring myself to like Leo which made Danniella the star of the book, a very persistent heroine with a funny personality. This was the first time I read a book by Kat Cantrell and I really liked the way she writes, so I’ll probably read a few of her books even though I won’t read more books in this series. I received a copy of this book for free, through NetGalley, in exchange for an honest review.